It’s finally here! The 2018 #MetLifeTakeover video took us forever to finish, but I think the results are worth waiting for. For the second year in a row the video was directed/edited by RizeOptix and hosted by comedian Oscar Collazos. We loved their work on the 2017 Takeover video and we were glad they could do it again. We have actually teamed up with RizeOptix again to work on something special for our 10th anniversary next year, but don’t tell anyone! The video is of course a recap of the 2018 #MetLifeTakeover during our week 2 win against the Jets at MetLife Stadium. It features footage from our Saturday night pre-party at Slattery’s Midtown Pub, our massive tailgate and we got some pretty amazing footage from inside the game as well. In past years we didn’t have a ton of footage from inside the stands but this year we got some great stuff including footage from across the stadium where you can see how fully we took over the upper deck. The video includes interviews with Dolphins alumni Mark Clayton, Mark Duper, Kim Bokamper, Joe Rose and Nat Moore who were all at the tailgate. Additionally there are interviews with Jason Jenkins who is one of our biggest supporters in the Dolphins organization, musician Solo D and a bunch of Dolfans. We unfortunately had to cut some of the fan interviews because we had so many, but you might see them as Instagram videos next year! Before we get to the video I just wanted to give some shoutouts: The Dolphins organization for always supporting our club, the Jason Taylor Foundation for donating a signed JT jersey for our raffle (We ended up raising $2000 for the Foundation! ), Urban Tailgate for doing all the hard work for our pregame party, Sailor Jerry for providing a ton of rum, Slattery’s as always for all the help on a day where we are actively taking people AWAY from their bar and of course everyone who came out, supported us, spread the word or donated anything to the charity. We have raised tens of thousands of dollars over the 10 years we have been doing this and we couldn’t do any of it without you guys. 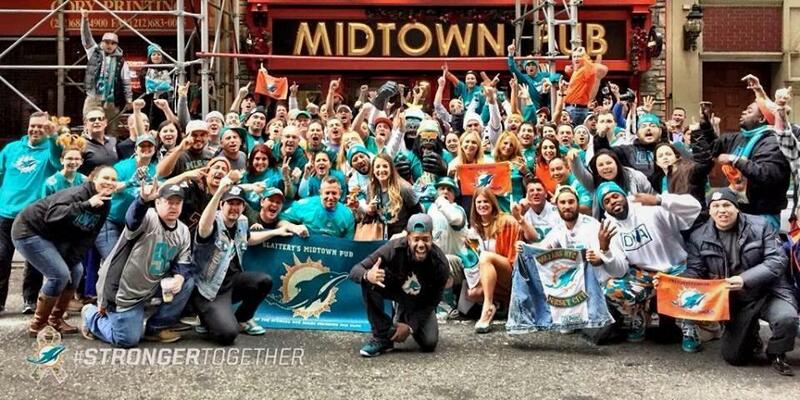 See you guys next year for the 10th anniversary of Dolfans NYC! We will be doing TWO #MetLifeTakeovers as the Dolphins play both the Jets and the Giants next year! Okay, it’s video time! Please share this with all your fellow Dolfans and let us know what you think! Oh, and make sure you watch until the very end! Wow, it’s been a long time since we have updated this website. Last year was brutal but it all starts again soon. I have tried to ignore football as long as possible after an exhausting season but it’s time to get back in that NFL mood. We are having a watch party at Slattery’s Midtown Pub for the first round of the NFL Draft. The draft starts at 8pm on Thursday April 28th and we will be getting started a little bit early so if you feel like pre-gaming I will be there by 7. As per every game day we have DJ Tropic DJing during commercials and stuff and unlike game day we have free appetizers for anyone wearing Dolphins gear! That being said, feel free to bring all your friends who root for other teams. This is the one day of the year we can get a long with only mild smack talk. They just have to pay for their food! Anyway, just wanted to give you that quick update. Hope to see a bunch of you on Thursday! Phins up! Just want to get this up quickly before the game and then I will come back and update with some more info. Just wanted everyone to know we are having a party next Saturday at Slattery’s Midtown Pub (8 East 36th St in Manhattan) from 4-7pm the night before the #MetLifeTakeover! 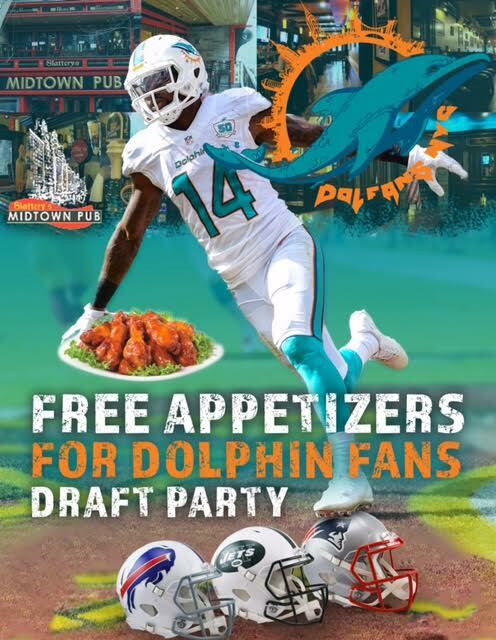 We will have some really serious raffle prizes, tons of Dolfans NYC merch for sale and a live performance from Solo D. DJ Tropic will be DJing all evening as well and we should have some cool surprises in store. It’s a great chance to meet fellow Dolfans before the game. Last year’s pre-party was a blast and Jay Fiedler showed up and signed some autographs. Don’t miss it! Lastly, we are doing a toy drive so bring an unwrapped toy and we will give you two free drink tickets for the #MetLifeTakeover tailgate thanks to Pabst Blue Ribbon! Early Morning Party At Slattery’s! So the Dolphins play at 9:30am on Sunday and we are gonna have a party. Slattery’s Midtown Pub will be open at 8am and will have some breakfast food options, a lot of coffee and of course some appropriate drinks. Fortunately for us before Slattery’s was our bar it was a soccer bar and they are used to opening at weird times for games. Despite the unfortunate few weeks the team has had this is Jets week and I wanna see everyone out at the bar. On top of just a big game and the weird timing, this is going to be Michelle’s last game as a New Yorker. As per her last post, she is moving to Miami and taking her husband and Dolfans NYC blogger Alex with her. Everything we do would be impossible without Michelle and we are all fortunate that she is still going to be working on the #MetLifeTakeover and helping out as much as possible from Miami, plus I know she’s gonna be coming up a few times a year to party with us. So come out early and let’s get some anger out on these Jets and give Michelle a hug because you won’t see her in NYC again until the #MetLifeTakover. Let’s pack the bar and have some fun at a totally unreasonable hour. Posted in Events, Preview | Comments Off on Early Morning Party At Slattery’s! What a great few days we had! On Sunday we threw a #MetLifeTakeover pre-party at Slattery’s Midtown Pub because we knew a lot of people weren’t going to be able to tailgate because of their day jobs. Monday Night Football is an awesome time but it’s not very convenient! It worked out really well considering the freezing rain Monday night and we had a lot of fun! Sunday was a great opportunity for everyone from out of town to meet each other and check out Slattery’s. It was also a great way for us to get a lot of the logistics out of the way. We handed out bus passes and gave out info about the tailgate and practiced some cheering. We also gave out a bunch of the Dolfans NYC #MetLifeTakeover rally towels that we had thanks to the support from AquaHyrdrate. We had some special guests as well! The Miami Dolphins sent two of their staffers Sergio and Hayle (Hayle’s dad is a Dolfans NYC regular) and they brought former Dolphins QB Jay Fiedler. He was just supposed to be there for an hour signing autographs and taking pictures but he ended up sticking around a lot longer and even introduced our other special guest Solo D. Solo D did a short set including the new Dolfans NYC anthem! As you probably know a big part of Dolfans NYC is our charitable donations so we had to have a HUGE fundraiser for the #MetLifeTakeover. The Dolphins sent us a ton of stuff to give away (including 150 shirts!) so we did free giveaways, a raffle and a live auction! 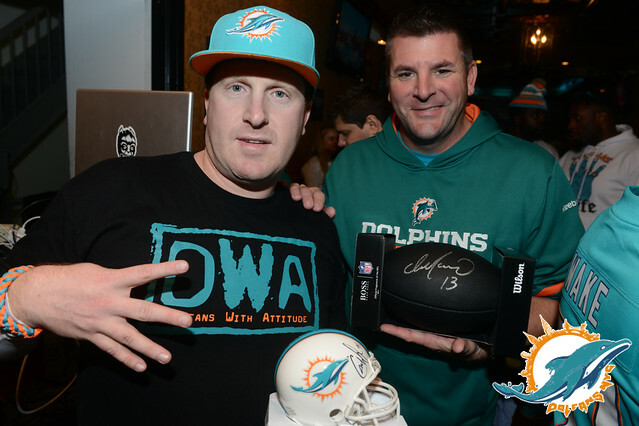 The raffle was a big success and we raised over $1200 the biggest prize of the night was a Ryan Tannehill signed helmet and that clearly went to the right people. Check out the amazing video they recorded when they gave the helmet to their kids. It brings a tear to your eye! The live auction went amazing as well! We had some game used cleats sell for $70, a playbook signed by Jarvis Landry go for $50 and a signed Mike Wallace helmet went for an incredible $550! With those items plus a few extra donations we ended up raising $750 for Darryl Talley the former Bills linebacker who is going through some very hard times as a result of brain injury from a career spent chasing Marino all over the field. Former ESPN AFC East blogger Tim Graham told Talley’s heartbreaking story and we are so glad we were able to help a former enemy. As much as we hate the Bills, we all love football and it’s moments like this when we an come together for something bigger. 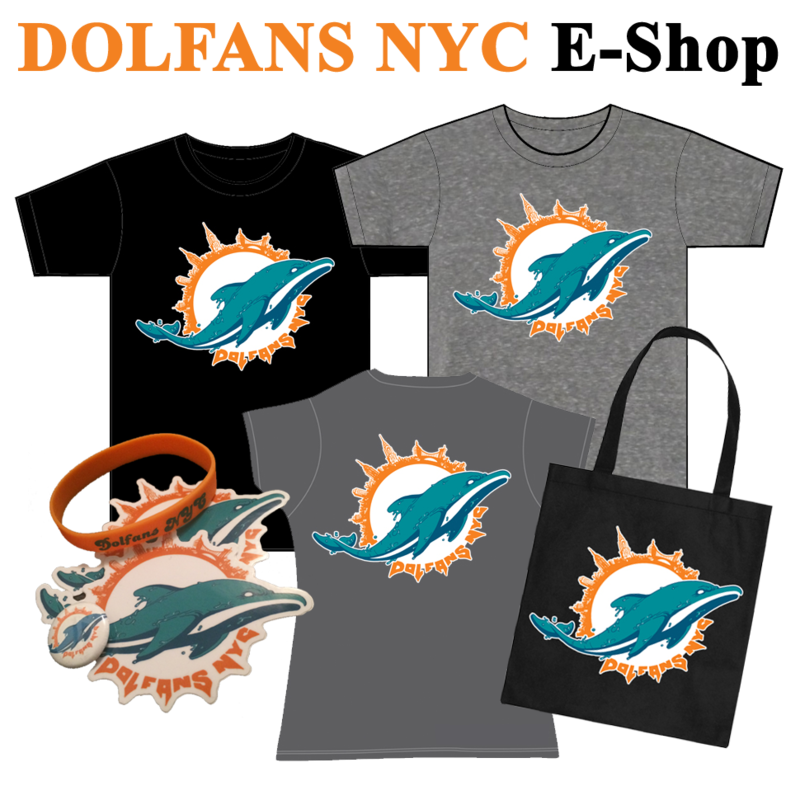 When you add the auction and the raffle and all the Dolfans NYC merch we sold we raised over $3000 that will go into the Dolfans NYC war chest so that we can throw bigger and better events and most importantly make charitable donations like the $5000 we recently donated to the Miami Dolphins Foundation. I have a feeling that Ride DCC will be getting a donation in the near future! Now before I get up all the photos from the actual #MetLifeTakeover I just wanted to thank everyone for coming out to the pre-party. I especially want to thank the Miami Dolphins, Jay Fiedler, Solo D, Slattery’s and AquaHydrate for making it one hell of a party. I also wanted anyone in the tri-state area to check out Jay Fiedler’s Brookwood Camps. The Fidler family runs a summer sports camp that combines normal sleepover camp fun with sports camps and is worth checking out. Always great to support a former Dolphin… especially one from New York! Now check out the photos below! If you want to download one, just double click it and it will open in a new window! Posted in Photos, Recaps | Comments Off on #MetLifeTakeover Pre-Party Pictures! I just wanted to throw up a post today with a bunch of small updates that you guys might want to know about. It’s hard to update after a loss but for once I felt proud of our team after a loss instead of just upset. It was completely heartbreaking to lose like that but to see our line step up after Albert went down and to see Tannehill play so tough after getting hit over and over again was pretty inspiring. Until that last drive, well after Finnegan went down, the Lions had only one pass worth talking about. Obviously it wasn’t good enough, but this is not your same old Dolphins. But let’s move on and get to the news. First of all, happy Veteran’s Day. We took the money we made on Sunday at Slattery’s and donated it ($300) to the Wounded Warrior Project. It seemed like the perfect timing for a donation like that. It means a lot that we can give back like this while doing something as fun as this club. In Dolfans NYC news we surprised everyone at the bar on Sunday by announcing that the Marks Brothers, Mark Clayton & Mark Duper would be coming to Slattery’s this Thursday for an autograph signing. We had waited until the last moment to announce because we didn’t have 100% confirmation. Unfortunately we should have waited a little longer because the event they were coming to NYC for got moved. Fortunately for us it looks like they may still be coming after all, just not until the December 14th game against the Patriots. Things are still a bit in the air but as soon as I get more info I will pass it on to you guys. This Thursday should still be a blast at the bar anyway. We are obviously playing a huge “must win” game. I mean they don’t get much more must win than this in November. Plus it’s prime time so that’s always a lot of fun. And we are doing a FREE raffle to make up for the Marks Brothers mistake. But make sure you get to the bar early. The upstairs of Slattery’s is reserved for us but the downstairs will have a post work happy hour crowd that will probably leave once the bar fills up with 300 Dolphins fans. Okay, that’s all I got for now but we will be updating soon with more news about the #MetLifeTakeover so be on the look out for that. Have a great Veteran’s Day! Yesterday was amazing. Not only did the Dolphins TROUNCE the Patriots but we had an amazing first day at Slattery’s Midtown Pub. 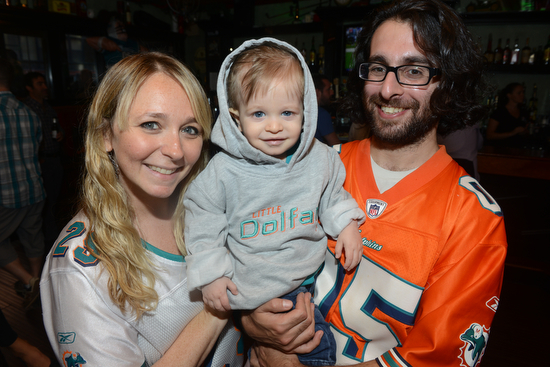 About 400 Dolphins fans showed up to our first meet up of 2014 and it was a blast. We had some technical issues to start the day with DJ Tropic’s DJ set up not quite working as planned and the upstairs TV’s looking like the Dolphins were wearing the Detroit Lions jerseys in the first half but DJ Tropic managed to kill it despite his limitations and the TV’s got fixed before the second half. Things are only going to get better from here! 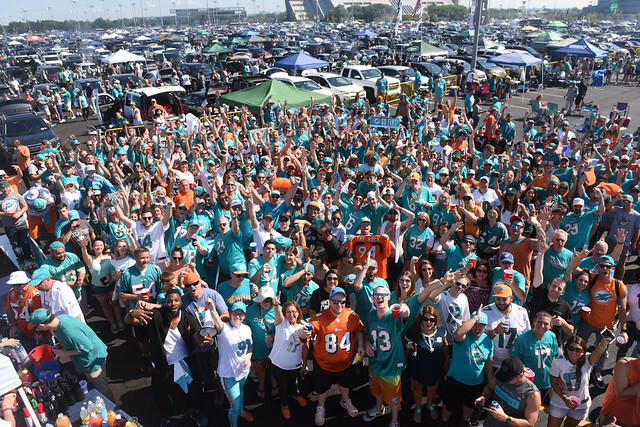 We have a lot more planned this year and hopefully the Dolphins will keep winning so that you guys will keep coming back in crazy numbers like yesterday. It was so much fun and we raised over $1000 for charity through the massive raffle and t-shirt sales and that doesn’t include our cut of the bar tab. We aren’t going to have a raffle every week but between our weekly events and the #MetLifeTakeover our plan is to donate over $10,000 to charity this year. Now about the game! Can you believe the Dolphins beat the Patriots by double digits despite giving the ball up three times, settling for four field goals, playing without three starting linebackers, Mike Pouncy, Reshad Jones and Dion Jordan, and getting mediocre QB play? Obviously we are going to have more injuries this year and we already lost Ellerbe for the season, but this team is just going to keep getting better. Even Tannehill haters know he can pretty constantly play better than yesterday. With this suddenly powerful run first offense Tannehill can be a game manager and still succeed. The Patriots look worse than ever, the Jets looked pretty bad despite the win and I still don’t think the Bills can be competitive with EJ Manuel. This season could be a lot of fun if yesterday wasn’t a fluke. Time for some photos! I took a bunch of photos before and after the game. I was way too panicked to do anything during the game despite an appearance from Michelle’s son Charlie! Also, despite being a professional photographer I took EXTREMELY mediocre photos. Oh well, such is life. You guys will probably dig them anyway. So check out the photos below! Phins up! Posted in Photos, Recaps | Comments Off on Patriots Game Day Photos!